The Australian Capital Territory (ACT) is situated within New South Wales and is the only completely land-locked Australian state or territory (i.e. does not have a coastline). ACT’s capital city is Canberra, which is also Australia’s national capital. The Ngunnawal people are the original inhabitants of modern-day Canberra. They are thought to have occupied the area for around 21,000 years. The Gundungurra, Ngarigo, Yuin and Wiradjuri people inhabited different locations around the Canberra region. The name Canberra comes from the area’s Aboriginal name meaning ‘meeting place’. It is thought that thousands of people came together in the Canberra area to hunt and enjoy resources and seasonal foods such as the Bogong moth and Yam Daisies. Joshua John Moore established a station at Acton in 1823, making him the first European settler in the Canberra area. Moore named his property ‘Canberry’ after the Aboriginal word ‘Kamberra’. In 1901, Australia federated to form the Commonwealth of Australia, and subsequently the Commonwealth Parliament was formed. This meant that Australia would need a capital city where Parliament could meet. A number of locations were suggested as capital city locations, and in 1908 Yass-Canberra was chosen. On 1 January 1911, the Australian Capital Territory was founded. Although the location had been decided, Australia’s capital city still needed a design. An international design competition was launched and the winning design, that of the American architect Walter Burley Griffin and his wife Marion Mahoney Griffin, was chosen from 130 entries. From these plans Canberra grew. In 1927 Old Parliament House was opened and Parliament finally assumed its place in Australia’s capital city. The population of the ACT is 406,400 people. Approximately 49.5 percent of people in the ACT are male and 50.5 percent are female. Aboriginal and Torres Strait Islander people account for 1.6 percent of the ACT’s total population. The top five ancestries for people in the ACT are: English, Australian, Irish, Scottish and Chinese. The top five languages (other than English) spoken in the ACT are: Mandarin, Vietnamese, Cantonese, Hindi and Spanish. The top five countries of birth (other than Australia) for people in the ACT are: England, China, India, New Zealand and Philippines. The ACT has a total area of only 2,358 km2 which accounts for less than one percent of Australia’s total land mass. 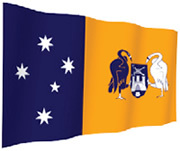 The ACT’s flag features Canberra’s Coat of Arms against a yellow background on the right-hand side and the Southern Cross against a blue background on the left-hand side. 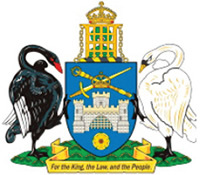 In 1927, Mr C R Wylie won a competition to design the Coat of Arms of the City of Canberra. The design was slightly modified before being granted on 7 November 1928. The Coat of Arms features a black and a white swan (to represent the Aboriginal people and the Europeans) supporting a shield. The shield displays a crown (representing British royalty), a white rose (for the Duke of York), a castle with three towers (for the three branches of Government), a sword, a mace, a portcullis face and a gum tree (representing growth and progress). At the base of the shield is the Latin motto Pro Rege, Lege et Grege which translates to ‘For the Queen, the Law and the People’. The ACT has two emblems: the faunal emblem and the floral emblem. 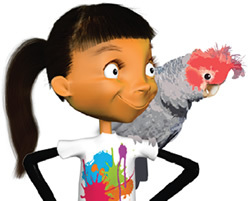 The faunal emblem of the ACT is the Gang-Gang Cockatoo. It was adopted on 27 February 1997. Canberra is the only city in the whole of Australia where these grey cockatoos live. The floral emblem of the ACT is the Royal Bluebell. It was adopted on 26 May 1982. The Royal Bluebell can be found in the mountainous areas of the ACT. The flower was named after G.G. Wahlenberg who was a Swedish Professor of Botany from Uppsala. The ACT is home to some beautiful, scenic landscape and many culturally and politically significant icons. As the home of Federal Parliament and Australian democracy, Canberra’s Parliament House is an Australian icon. Located on Capital Hill, the impressive building was opened in 1988 by Queen Elizabeth II. Before it opened, Parliament met at Old Parliament House (now the Museum of Australian Democracy) which was opened in 1927. The current Parliament House is made almost entirely of Australian materials including timber (such as Western Australian Jarrah), granite and marble. The architect, Romaldo Giurgola, designed the building so that it is modestly nestled within Capital Hill. Every year, more than one million visitors and tourists visit Parliament House to explore the building’s 250,000 square metres and view the extensive Parliament House Art Collection. When Parliament meets, the building has around 5,000 staff in its 4,500 rooms. Namadgi National Park, just outside of Canberra, is a part of the National Heritage Listed Australian Alps. The park is made up of 106,095 hectares of stunning landscapes, accounts for 46 percent of the Australian Capital Territory’s area and provides Canberra with its drinking water. Many important Ngunnawal campsites and spectacular rock art sites, such as the Birrigai Rock Shelter and Yankee Hat Shelter, can be found within the national park’s boundaries. The park is also home to hundreds of species of Australian wildlife such as birds, bats, kangaroos, wallabies, fish and frogs. With 160 km of marked walking tracks, historic homesteads and abundant wildlife and scenery, Namadgi National Park is great for hiking, camping, biking, caving, skydiving, paragliding, picnicking, horse riding and exploring. 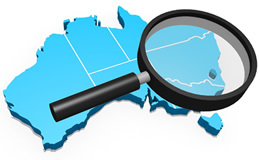 The ACT is often called the ‘Nation’s Capital’ or the ‘Bush Capital’. The Lodge is the name of the Australian Prime Minister’s official residence in Canberra. In 1827, James Scullin, the Leader of the Opposition, campaigned against the expensive costs of the building. When his party won the 1929 election, making him Prime Minister, he stuck to his convictions and refused to move in to the building. Australia’s first Prime Minister was Edmund Barton. Many Prime Ministers have followed him including Robert Menzies, Harold Holt, Gough Whitlam and Robert Hawke. Many talented film stars were born in the ACT including Sigrid Thornton, most well known for her role in ‘The Man from Snowy River’ (1982), and Mia Wasikowska most well known for her role alongside Johnny Depp in ‘Alice in Wonderland’ (2010). Canberra holds many festivals such as the Balloon Spectacular, the National Folk Festival and Floriade. Advertising billboards along the roadside are banned in the ACT, with the exception of bus shelters. While Old Parliament House was intended as a provisional building to house Parliament for only 50 years, the new Parliament House at Capital Hill is intended to house Parliament for 200 years. Canberra is home to The Royal Australian Mint and is responsible for producing all of Australia’s circulating coins. Rare and historical coins can be viewed, as well as the coin making process involving some amazing robots. 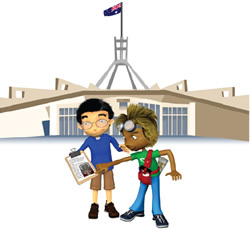 In 2013 Canberra celebrated 100 years as the nation’s capital and the home of Parliament. Throughout the year there were many exciting celebrations to mark this exciting event.